Self-expandable metallic stents (SEMS) have become an increasingly accepted minimally invasive alternative to surgery in patients with colorectal obstruction. The aim of this study was to compare the results of SEMS with patients undergoing surgery for acute colonic obstruction at our hospital during five years (August 2003-August 2008). Patients with acute colonic obstruction or tight strictures received a SEMS either as a palliative procedure or as bridge-to-surgery. The patients were followed prospectively. The decision of SEMS or surgery was taken by the surgeon on call. Patients admitted to the same hospital with acute colonic obstruction treated with surgery were reviewed retrospectively. Median follow-up time for SEMS was 5 (0-61) months and for the surgical group 8 (0-59) months. A total of 135 patients were planned for SEMS treatment. Of these128 received a SEMS (28/128 as bridge-to-surgery). The median age was 73 (16-97) years. The indication for SEMS was colonic obstruction (61), stricture (71) and bleeding or other causes (3). The main diagnoses were colonic cancer (95), rectal cancer (20), diverticulitis (3) and other (17), and 90/128 had disseminated disease. Ninety-nine percent of procedures were considered a technical success, and 88% clinical success. The complications (17%) were mainly migration (6), fistula (5), infection (2), pain (2) and perforation (7). In total 10/22 patients with complications required surgery. Median post-operative hospital-stay was 3,5 days (0-40). The total thirty-day mortality was 7%. During the same period of time 75 patients were operated due to acute colorectal obstruction. Median age was 73 (32-97) years. The stricture was caused by colorectal cancer (57), rectal cancer (3), diverticulitis (7) or other causes (8). 16 out of 75 had disseminated disease. Fifty-three patients received a stoma, out of which only 15% have had the stoma removed. Complications (31%) were mainly anastomotic dehiscence (2), stoma-related problems (2), wound infections (3), cardio-pulmonary (7) and multi-organ failure (4). The median post-operative hospital-stay was 8 (1-45) days. The total thirty-day mortality was 16%. 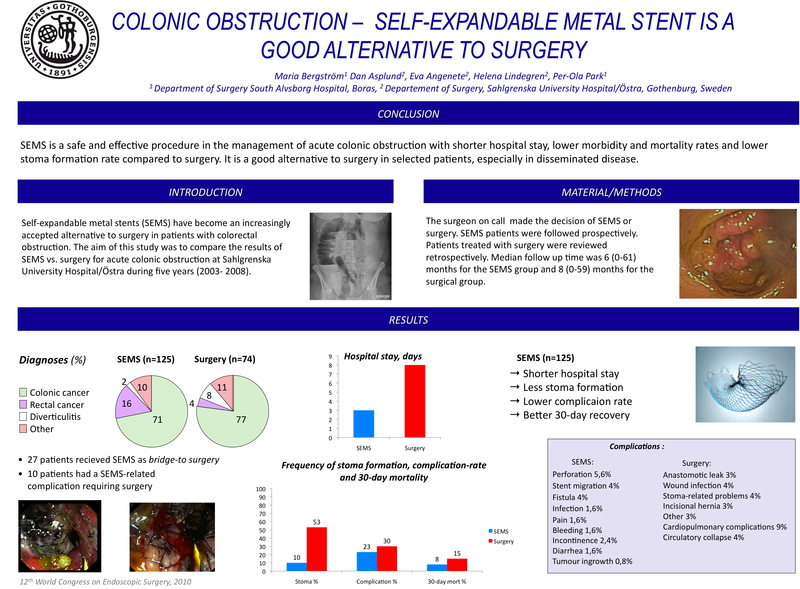 SEMS is a safe and effective procedure in the treatment of acute colonic obstruction with a shorter hospital stay as well as lower morbidity and mortality rates compared to surgery. SEMS is a good alternative to surgery in selected patients, especially in disseminated disease.